are perfect for your portable or permanent metal step needs. 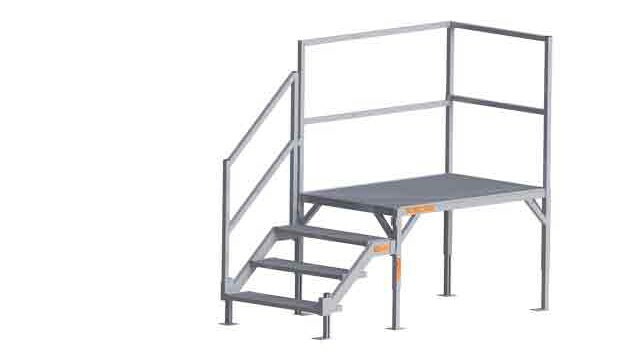 These stairs easily adjust in height,from 3-4 steps or 4-5 steps, with a durable welded construction ready for the job site, trailer, office building & more. 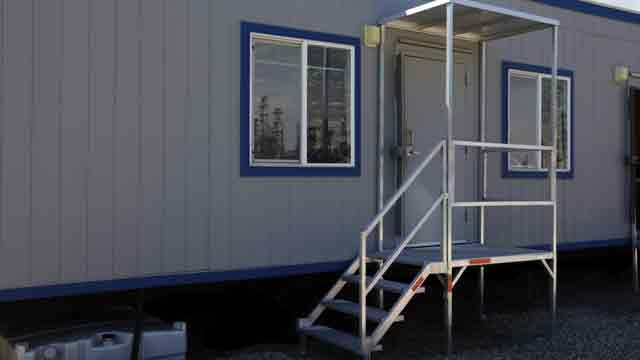 Office Trailer Steps, Modular Office Steps and Install in Minutes! Made of durable, lightweight aluminum that does not rust, rot or decay. Our Metal Stairs are Made in the USA! 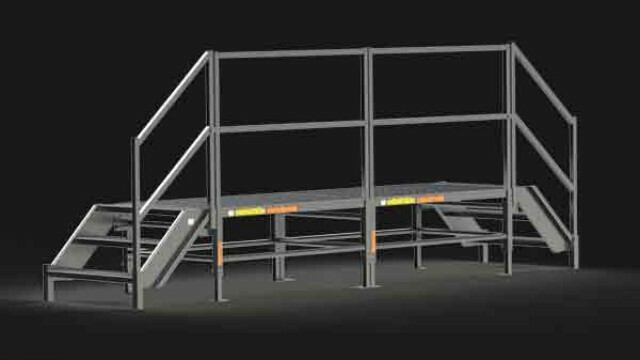 OSHA Metal Stair Systems - These Fortress ™ Portable OSHA Stairs are easily adjustable to fit your industrial metal stairs needs. Portable steps are easy to adjust from either 3 to 4 steps or 4 to 5 Steps in just minutes. 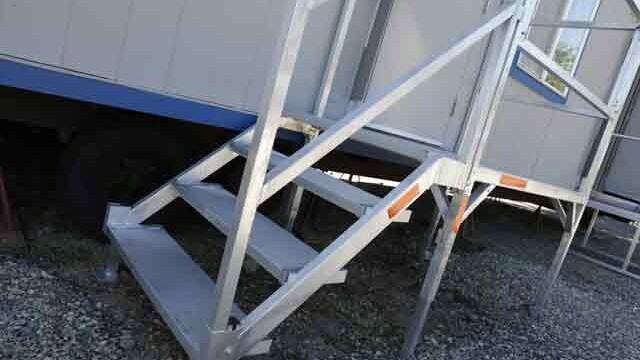 These aluminum trailer steps are durable enough for permanent installations or as temporary portable steps. 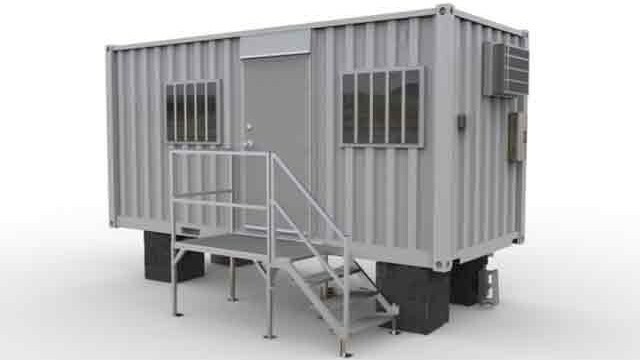 These are perfect for modular office buildings, industrial sites, office trailers and construction sites. Each metal OSHA step is a full 36 inches wide and has a rise of 8.5 inches. The metal OSHA stairs are easy to adjust as needed. Our OSHA metal stairs systems meet OSHA Steps Standards are made of lightweight aluminum for outdoor durability that does not rust, rot or decay. The portable step systems have a large 40" x 60" platform which can allow access to either side of the platform. 3-year manufacturer's warranty on OSHA portable staircase. Our Quality Fortress ™ Portable Stairs meet OSHA Steps Standards and are Made in the USA! 8100 23" to 34" 60" to 40" 9.5" to 36" 1000 lbs. 8200 27.5" to 42.5" 60" to 40" 9.5" to 36" 1000 lbs. Fortress Metal Step Systems disassemble for easier moving. Weights are approximate. How many Handrails are Included? - Each Step system comes with 1 handrail for the stair risers and 1 handrail for each of the two size sides of the platform. Are the support legs adjustable? - Each support leg is independently adjustable for easy leveling. Fortress Portable OSHA Stairs System 23" to 34"
Fortress Portable OSHA Stairs System 27.5" 42.5"
Most OSHA Stairs Ship the Same Day! We ship from WA and KY for the fastest delivery anywhere in the USA! *Step System weights are approximate and may vary somewhat.